Gujarat Sabarmati for 120 km stretch is dead Great work by PSS and others. Several civil society organisations led by PSS, Vadodara, in close coordination with the GPCB have released reports’ on joint investigations by pollution levels in the Sabarmati river, finding their condition disastrous. 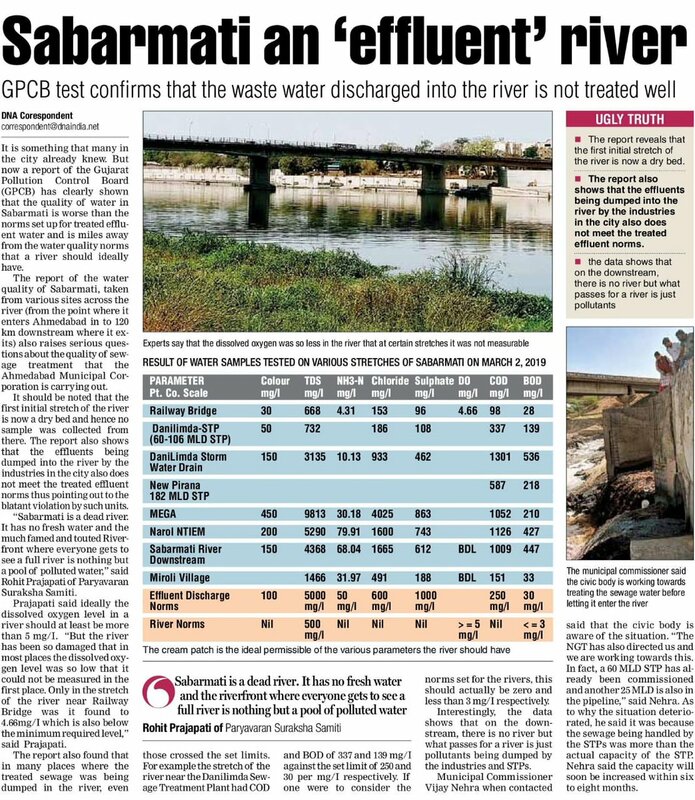 The reports note that Sabarmati river in the Ahmedabad City stretch, beyond the much- publicised riverfront, is dry, though within the riverfront project stretch it is brimming with stagnant water. In the last 120 kilometres, before meeting the Arabian Sea, carrying effluents from industries from Naroda, Odhav Vatva, Narol and sewerage from Ahmedabad city. – On March 12, 2019, regional officers Tushar Shah and Nehalben Ajmera of the Gujarat Pollution Control Board (GPCB), Rohit Prajapati and Krishnakant of the PSS, social activist Mudita Vidrohi of Ahmedabad, Gujarat High Court lawyer Subodh Parmar conducted a joint investigation. CAUVERY Shrinking area and decreasing farm productivity in Kaveri delta EXCELLENT REPORT ON CAUVERY: The delta of river Kaveri, which is the agricultural backbone of south India, has shrunk by 20 percent because of diversion of land for non-agricultural purposes and climate change. The region witnessed an increase in the wasteland area since 1971, according to experts. Upstream dams trap silt and do not let it flow into the delta. Water-intensive agriculture and industrial practices are adding to the problem. The farmers of the delta are taking the issues into the national election discussions. – According to him, the delta region is shrinking fast with cultivable lands increasingly deteriorating into wastelands. To substantiate his claim, Vimal Nathan quoted findings of a study by S. Janakarajan, a retired faculty member with the Madras Institute of Development Studies (MIDS). According to Janakarajan, the delta region witnessed a 13-fold increase in wastelands since 1971. – Even the available water remains extremely contaminated causing irreparable damage to both soil and agriculture. Chemical factories located in the close vicinity of the Stanley Reservoir in Mettur have been identified as major polluters of the river. Mass fish mortality is reported from the delta region regularly. In the downstream region, tens of small- and medium-scale chemical industries continue to discharge their effluents through natural drains and engineered canals into the Kaveri. A water-guzzling coal-fired thermal power plant at Mettur is also contributing to the present sorry state of affairs in Kaveri. The plant has permission to draw 184 million litres per day (MLD) of river water. Coal ash from the plant is often dumped up on a hill, from where it finds its way back to the river. – River Bhavani, a major tributary of the Kaveri joins it in Erode. It brings with it effluents from dyeing industries, leather tanneries and pulp and paper mills – large scale water-users and heavier polluters. Further south, the industrial town of Salem discharges about 35 MLD of untreated sewage into the Kaveri through the Thirumanimuthar rivulet. – Interestingly, there is a considerable increase of mangrove cover in the region. “You may feel happy about the increase of mangrove cover. But it reflects a grave reality. Mangrove cover is increasing due to seawater ingress in the coastal areas. Available data indicate that the mangrove cover has gone up nearly 14 times since 1971,” said Vimalnathan. Due to seawater ingress, the coastal portion of the delta region is witnessing a substantial rise in shrimp farming, which is detrimental to agricultural practice. – While the delta is facing decrease in sediment deposit, the Mettur dam is facing water storage problems due to siltation. Built in 1934, the dam used to have a storage capacity of 2708.8 million cubic metres (MCM). By 2004, this was reduced to 1994.2 MCM. Besides, data reveal that its capacity had reduced further to 1,889 MCM in 2015. With the union government having initiated a massive hydrocarbon extraction project in the delta region, unmindful of the environmental and livelihood concerns, farmers are turning hopeless of a better tomorrow. NARMADA 43 साल में पहली बार मार्च में सबसे कम हुआ नर्मदा का जलस्तर Narmada water level at Harda in Madhya Pradesh at its lowest since 1977. CEC is visiting Panna National Park for petition challenging approval given by Standing Committee of National Board for Wildlife for Ken-Betwa link project. GANGA Bihar Sorry state of Ganga downstream of Farakka One of the worst stretches is in Murshidabad district of West Bengal, where the Ganga’s biodiversity is being affected by constant human intervention. Many blame the Farakka barrage for the pathetic condition of the river. Ganga has an average annual discharge of 11,811 cumecs at Farakka. Report Drying Himalayan springs a severe crisis Wonderful interview with Dr. Aditi Mukherji. Opinion Brahmaputra as a new model of democracy and development WOW: Shiv Vishvanathan on Brahmaputra River: It is crucial to understand the link between time and the river because I am not past, present or future. I am each of them and all of them simultaneously… I am Tsangpo, Narichu, Tanjoo Khampa, Tamyak, Sangchen, Chimbo, Siang Dihang, Shyama, Sema, Singla, Tilao Taluk… The river was nature’s first novel feeding on folklore and myth… One of the biggest problems a river faces is not the people who live by it but those who study it… Explorers never understand a river; they only measure it. For them a river is not a labyrinth, a mystery, it is a puzzle which must be solved if I am to be left at peace. Bowing to pressure by activists to save the Salim Ali #BirdSanctuary, the #Pune Municipal Corporation (@PMCPune ) has agreed to restore the 200 feet long stream which flows through the sanctuary. The sanctuary is spread over 440 acres. Study Pumped hydro storage needs $20 billion investment in India Tapping into the Pump Storage Hydro sector’s potential needs at least $20 billion investments annually, says a research by the Institute for Energy Economics & Financial Analysis (IEEFA). Development of PHS, though, comes with a caveat- the attendant problems like enormous social costs and the absence of a strong policy signal for producers and consumers. Maharashtra Nine more Yavatmal villages to boycott polls Close on heels of the decision taken by Dabhadi village in Arni tehsil of Yavatmal to abstain from voting in the Lok Sabha elections, nine villages in Mahagaon tehsil have also decided to boycott polling scheduled on April 11. In a joint meeting on March 27, the villagers of Ejani, Pohandul, Tivarang, Chikhali, Malkapur, Bhosa, Dahisavli, Dhanoda and Wadhnath took the decision to draw the attention of the district administration towards their long pending demand of releasing water from Veni dam of Pus Project for agriculture purpose. IRRIGATION SCAM IN TELENGANA SC notice to Telangana, BHEL on alleged irrigation scam The Supreme Court on March 25 issued a notice to Telangana, BHEL and others on a petition alleging a huge scam of Rs 35,000 crore in the Palamuru Ranga Reddy Lift Irrigation Project. A bench of justices S A Bobde and Sanjiv Khanna also sought a response from the CBI on a petition filed by former MLA of Andhra Pradesh Dr Nagam Janardan Reddy. The petitioner, represented by advocate Prashant Bhushan, alleged a loot of several thousand crores in the tender relating to the electro-mechanical equipment manufactured by the BHEL in the lift-irrigation project. He sought a CBI investigation in the matter. Rajasthan 4 labourers killed during illegal mining operations in Bundi Four labourers, including a woman, have died after a sand dune collapsed on them during illegal sand mining operations in Rajasthan’s Bundi district, police said March 27. The incident occurred in Chambal Crocodile Sanctuary near Sunagar village on March 26 evening, SHO, Keshoraipatan Police Station, Abhishek Pareek said. Bundelkhand After Ken, sand mining threat to Dhasan river After Ken, illegal sand mining is posing threat to another river in drought-prone Bundelkhand. Excessive mining is taking place in Dhasan river in Nowgaon tehsil where heavy machines are playing havoc with its ghats and disrupting its flow. No wonder, with water crisis looming large, the local villagers are up-in-arms against the sand mining in Dhasan. After the villagers saw heavy machines damaging the ghats and mounds of sand at many places that block the river flow, the irate villagers even pelted stones in protest. The region is already facing water crisis which is likely to deepen further. People in Alipura village were stunned on March 26 when they found heavy machines being deployed to dig out the sand. “Heavy machines were operating near the ghats and damaging them. The jugaad pandoobis were sucking the sand after which we pelted stones at the people operating them”, said a villager. Though the district administration is tight-lipped over the issue, sources said that a four hectare mine, which was earlier in the possession of Alipura panchayat, has been leased out to four miners for four years. 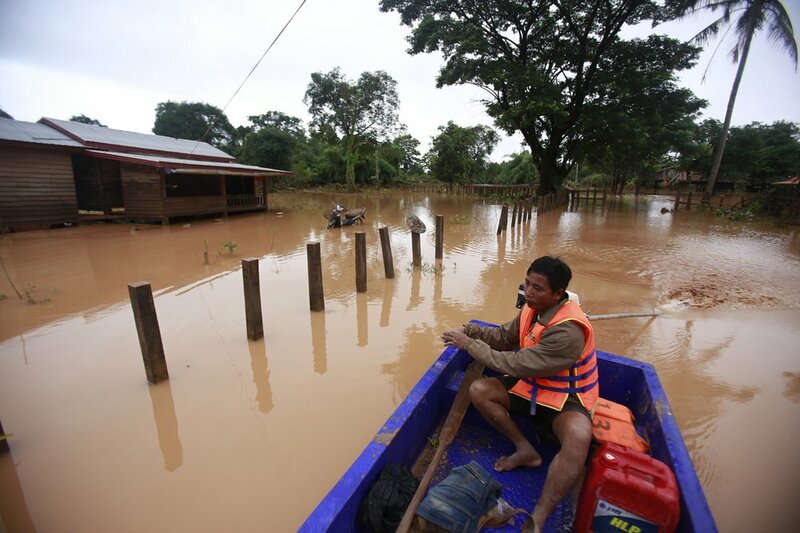 “But the problem starts when they start digging out a larger area and damage the river. They should not be allowed to damage the ghats and block the river flow”, sources said. HC gets tough on sand mining, seeks report from officials Important hearing and directions by Madras HC regarding illegal sand mining in Tamil Nadu: – The judges wanted to know about the provisions invoked against illegal mining and transporting sand while registering the FIR, and asked how money had been collected as fine for such activity in the last 10 years. They asked if the fine was levied or cost of the minerals was recovered. The court said a report on the action taken should be submitted to it at the next hearing on April 21. – The judges then directed the government to collect Rs 75 lakh from the officials for allowing illegal mining in unapproved areas in Sitharevu village in Attur area of Dindigul district. Stating that the case pertaining to the district was only the tip of the iceberg, the judges said illegal mining of sand and blue metal had become a regular feature in Tamil Nadu. Punjab 4 held for sand mining in Fazilka Four persons have been arrested on the charge of illegal sand mining in the border village Mohar Khiva, Bhiwani, of Fazilka district. The accused have been arrested on the basis of a complaint lodged by a senior Army official. Uttar Pradesh Wetland authority to ban summer paddy cultivation Raising concern over depleting groundwater, UP State Wetland Authority (SWA) has decided to ban the cultivation of summer paddy that survives only on the groundwater. According to an estimate of the state agriculture department, summer paddy — the transplantation of which has already been started — is produced in around 3.5 lakh hectares in more than 20 districts of western UP stretched up to the Tarai region. The decision was taken by SWA chief executive officer Vibhash Ranjan on World Water Day. – “The cropping pattern in the state needs to be brought under regulation in phased-manner, and to begin with we will motivate the farmers not to grow summer paddy. As the crop is transplanted in March for harvesting in June, before the arrival of monsoon, the irrigation of this crop contributes to rapid depletion of groundwater,” said Ranjan. “The protection and conservation of 26,000 wetlands having area 2.5 hectare or above and 97,000 water bodies of smaller size, a project undertaken by SWA to recharge groundwater, will not succeed unless there is a ban on the production of summer paddy,” Ranjan explained. Delhi Decide whether Tikri Khurd lake in Narela is wetland: NGT The green tribunal has directed the Wetlands Authority of Delhi to hold a meeting and decide within a month whether the Tikri Khurd lake in Narela here is a wetland. “If any steps are required to be taken for making the Wetland Authority fully functional, such steps may be taken by the Delhi chief secretary. Even if it is found that the area in question is not technically a wetland, the lake is required to be preserved as a water body. The tribunal also directed the CPCB to ascertain whether the National Wetlands Authority is functioning at the central level and Wetland Authorities at all the states or Union Territories. “If not, their functioning be required to be operational within one month. Such authorities may identify wetland and water bodies and take further steps for their protection. A status report in the matter be furnished before the next date,” the bench, also comprising Justice K Ramakrishnan and expert member Nagin Nanda, said. Kerala A campaign to watch out for the ‘water mafia’ The Floating Conference on a boat, organised by the Green Care Mission as part of its week-long water literacy programme in connection with World Water Day, was notable for its stress on the need for water literacy to maintain the quantity and quality of water we use in our daily lives. The ‘Floating Conference’ on the Chaliyar river at Mavoor on March 30. Report Number crunching helps farmers manage water In villages where the system still worked, farmers had either organized themselves into cooperative credit societies or had continued commitment from the NGOs even after the project period. The study also found that farmers were more cautious and followed rules in villages where groundwater levels were low whereas negligence crept in at places with abundant groundwater. Haryana Over 400 Panipat dyeing units extract groundwater illegally An RTI query has brought out that only four dyeing units out of about 400 have a no-objection certificate (NOC) from the Central Ground Water Authority (CGWA) to extract groundwater. 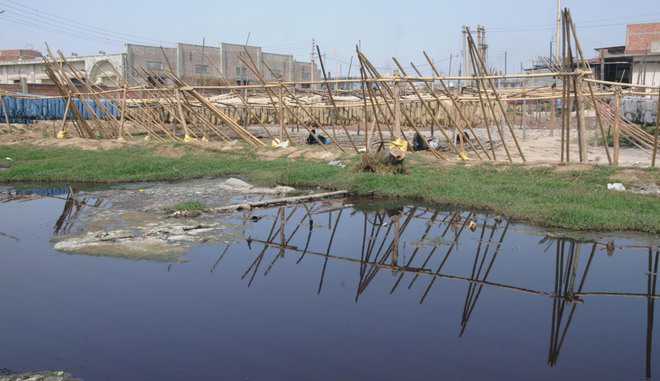 The extraction of groundwater by legal and illegal dyeing units is about 70 MLD. The 300 dyeing units in Sector 29 part-II extract the most: more than 40 MLD. 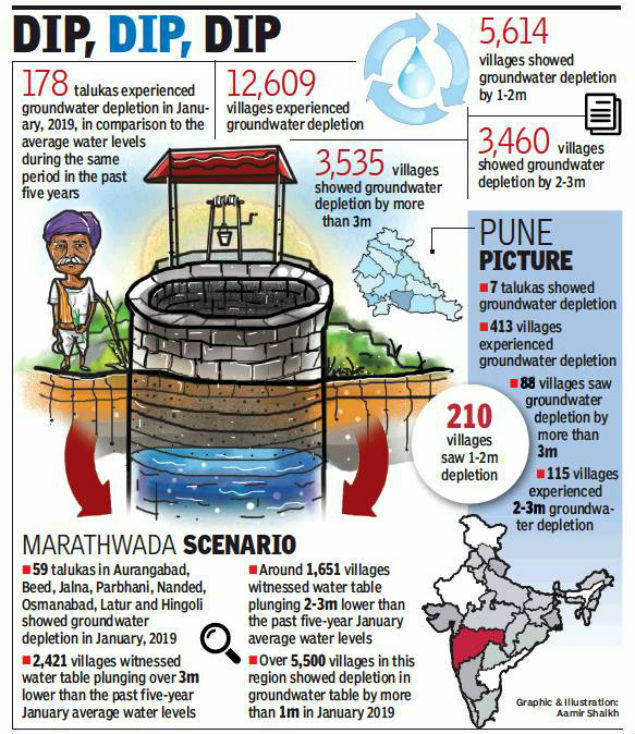 Maharashtra Groundwater table depleted in half of state in January The data from the Groundwater Survey and Development Agency (GSDA) mean the water table in 50% or 178 talukas (of the 353 monitored by the GSDA) in the state during January 2019 plunged below than the average levels for the month in the past five years. – In January 2018, nearly 10,300 villages showed groundwater depletion by more than one metre. This January, the number has increased to 12,609 villages. An official from GSDA said all these 12,609 villages had recorded over 20% or more rainfall deficit in monsoon last year. There are approximately 44,000 villages in Maharashtra. – Over 3,500 villages in the state have registered a dip in the groundwater table by over 3 metres in January 2019 in comparison to the average January levels of the past five years. The GSDA monitors water levels through 3,920 observation dug wells, covering the entire state, in 1,535 watersheds. Hyderabad GHMC borewell supplies polluted water Newly dug borewell 3 days ago poured chemical-laden water in Quhbullapur area showing status of groundwater pollution. The officials, who never bothered to look into the repeated plaints on water pollution, were in for a surprise when a new dug out borewell in municipal office started dispensing polluted water! Gujarat Groundwater in Padra worse than industrial waste! Environment activists are seeing red over the deteriorating quality of groundwater in Luna village of Padra taluka considered to be Gujarat’s ‘vegetable bowl’. Get ready for another chronic water shortage this summer Very informative piece by Indulekha Arvind on reasons behind growing water scarcity in metro cities of Bengaluru, Chennai, Mumbai, Delhi and efforts being made by respective govts to avoid the crisis. Clearly treating and reusing waste water, recycling and rainwater harvesting are far better options than investing in expensive, unsustainable projects like desalination plant (Chennai), Cauvery water (Bengaluru), Gagai dam (Mumbai). Most important is focusing more on demand side management. Gujarat Where is Narmada water sample test report? Activists have questioned the extreme secrecy surrounding the sample test report of the Narmada water. It should be noted that the water in the Sardar Sarovar Dam reservoir had turned black and water supply to 138 villages in Narmada and Chhota Udepur district had been discontinued in the beginning of February. While preliminary report of the sample by Gujarat Water Supply and Sewage Board (GWSSB) had indicated presence of sulphide in the water, the authorities had later said that that the water had high level of bacteria but met all other parameters. “We have written to the department to show us the report of the samples. If the reports are fine why is the secrecy around it. Moreover, the department within two days restored the water supply with the warning that the people should take adequate precaution because it had high level of bacteria,”said Mahesh Pandya of PSS at a press conference. Panday an environmental activist also alleged that the GWSSB has also happily embraced the permissible limit for different parameters for drinking water instead of the standard limit. “Under the standards for drinking water issued by the Centre, the standard limit for total dissolved solids is 500 mg/I but the permissible limit is 2000 mg/I. But what the board has not clarified is that the permissible limit can be only accepted in absence of any alternative source and that too subject to some conditions,” said Pandya. He said the government was thus relying on the permissible limit for drinking water and washing its hands of providing quality water to the people. Report The water we don’t touch may be leaving us drier The daily norm set by India for water use (3000 Litres per capita per day) is 150 litres per person daily in cities and 55 litres per person daily in villages. So, the average daily water footprint of an Indian is 20 times the per capita use in cities and more than 50 times that of villages. Opinion Incorporating principles of circulation economy in JalYukt Shivar On one hand, the official data released by GoM and work of Paani Foundation of reaching 5462 villages from 40 districts shows that the project has been successful in reducing water shortages in Maharashtra. On the other hand, there are studies which show that the project is unsustainable due to unscientific implementation, undue reliance on machinery, lack of transparency and public participation, and inappropriate selection of geographical locations. The following maps from IMD shows the rainfall in India during March 2019: Sub division wise, state wise and river basin wise. Normal rainfall during the month at all India level is supposed to be 30.9 mm, but actual rainfall was 41% below normal, at 18.3 mm. SUB DIVISIONS: Only one subdivision (Gangetic W Bengal) had excess rainfall at 42% above normal, while 7 other subdivisions had normal rainfall, 14 had below normal rainfall, 12 had large deficit (above 60% deficit) and two subdivisions (Gujarat, Konkan & Goa) had no rain at all. STATES: Only W Bengal had excess rainfall among all the states in India. Six had normal rainfall, 13 had below normal, 12 large deficit and 4 had NO RAIN. RIVER BASIN WISE: The map seems to show anomalies with respect to the subdivision wise and state wise rainfall figures. Gujarat ‘We Fear Drought More Than War,’ Say Border Villagers WE SHOULD BE CONCERNED ABOUT DROUGHT IN THESE BORDER AREAS: Mota is among the last villages before the international border in western Kutch. Jaloya is about 35 km from the international border in north Gujarat’s Banaskantha district. Both districts are going through one of the worst droughts in recent history. Kutch has received only 26% of its 30-year annual average rainfall, while Banaskantha has received 33%. The talukas – administrative subdivisions – within which the two villages are located have fared even worse. Mota is located in Bhuj taluka, which has received 22% of its 30-year average rainfall. Suigam taluka, which contains Jaloya, has received only 10% of its average. For Kutch, this year has turned out to be the worst since 1985-88, when the district faced three successive years of severe drought. Maharashtra Power supply to be cut/controlled to stop water stealing The district administration has announced that water for drinking purpose would be released from Ozharkhed dam for the villages in Dindori, Niphad and Chandwad talukas from April 1 morning. While 430 million cubic feet (mcft) water from Ozarkhed dam will be released through the left bank canal, 200 mcft will be released into the Palkhed dam. Telangana Farmers’ prospects dwindle in erstwhile Karimnagar The prevailing heat wave conditions and depleting groundwater level have led to standing crops withering away in various parts of the erstwhile Karimnagar district, causing farmers to worry over their prospects. They took up large-scale cultivation of paddy given the availability of water in SRSP and LMD reservoirs. 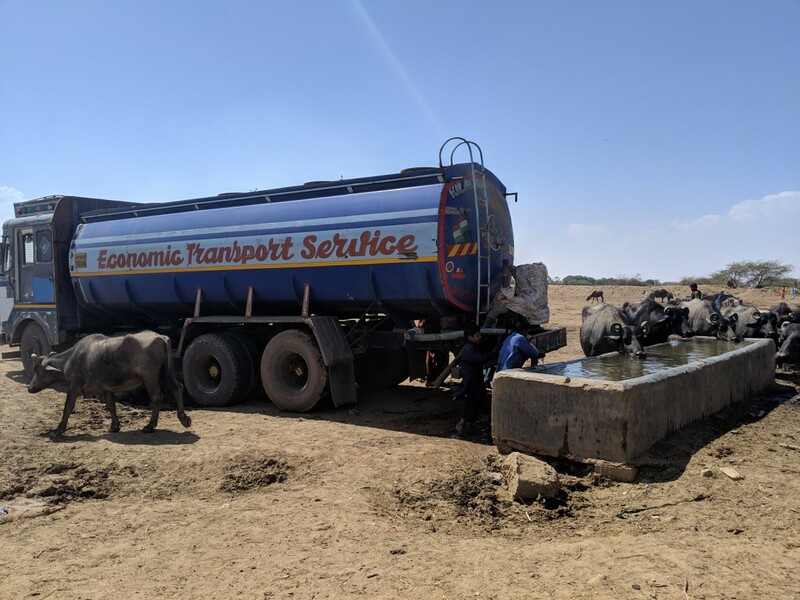 But the government could not provide water to the command areas owing to reduced water levels in the reservoirs in the later days. Though the government released the available water, it did not reach the tail-end farmers as it was pilfered by farmers in the upper region. SANDRP Blog Western Japan floods 2018: Hiroshima and the Summer of the Deluge Guest blog by Aparna Datar on Hiroshima floods of Western Japan in 2018. She travelled to the flooded villages and communities before writing this, thanks to Prof Moe Nakazora of Hiroshima University. US MIDWEST FLOOD 2019 Northwest Missouri farmer weighs in on the Flood of 2019, ‘This is the very worst’ Flows from the Gavins Point dam (has been increased to 30 000 cusecs on March 26) affect river levels in downstream communities such as Omaha; Plattsmouth, Nebraska; Hamburg, Iowa; and St. Joseph, Missouri. As reservoirs fill, Corps of Engineers juggles Missouri River flood woes Said John Remus, the chief of the Corps’ Missouri River Basin Water Management Division in Omaha, the situation puts the Corps in a delicate position of trying to clear room in reservoirs while not imperiling already hard-hit communities in Iowa, Nebraska, Missouri and Kansas that have endured one bout of flooding this spring. Officials had hoped to delay stepped up increases at Gavins Point until after the crest from the Big Sioux River had already made it into the Missouri River, but, Remus added, “We’re not going to be able to do that entirely.” Gavins Point releases increased to 27,000 cusecs on Monday (March 25). They were forecasted to go to 36,000 CFS by Thursday, but they could also go higher. – The Corps still has 85 percent of its capacity to handle snowmelt, but that was down by 10 percent in just one week. Water was flowing into Lake Oahe at 98,000 CFS Monday while releases were at 3,500 CFS. Climate forecast offers little comfort Using data from the U.S. Historical Climatology Network, I have shown that from 1951 to 2013, mean precipitation for the United States increased by 1.6 percent per decade. In the Midwest, however, it rose by about 2.1 percent per decade, and winter precipitation increased by 3.7 percent per decade. About half of this growth was caused by more frequent storms, and the other half can be attributed to an increase in storms’ intensity. From 1951 through 2013, my study found that light and moderate precipitation across the Midwest increased by about 1 percent per decade, while heavy precipitation increased by 4.4 percent per decade. ‘Breaches Everywhere’: Flooding Bursts Midwest Levees Hundreds of miles of levees in the Midwest have been overwhelmed by the floods, leaving “Swiss cheese” infrastructure and reigniting a flood control debate. – Last year, landowners from four Midwestern states won a lawsuit against the Army Corps of Engineers, the lawsuit claimed the repeated floods amounted to a seizure of their property. According to the US Army Corps of Engineers, which oversees infrastructure on the Missouri River and some of its tributaries, at least 62 levees had been breached or overtopped in the Midwest in March, and hundreds of miles of levees had sustained damage. – In the early 20th century, the Army Corps of Engineers and towns along the Mississippi River followed a “levees only” policy that meant building higher and higher walls, leaving the river no way to release its power. That strategy failed spectacularly in the Great Flood of 1927, which inundated 27,000 square miles and displaced one million people. In the aftermath, officials built a more complex Mississippi River system that included a network of spillways and flood ways, as well as other tools, along with the levees. – Attempts to harness the Mississippi River have led to a land-loss crisis in Louisiana. The state loses a football field’s worth of land every hour and a half. A huge public-works project, aimed at correcting for the unintended consequences of previous interventions, is getting under way. – A variety of factors are driving the “land-loss crisis,” as it’s come to be called. But the essential one is a marvel of engineering. Thousands of miles of levees, flood walls, and revetments have been erected to manage the Mississippi. As the Army Corps of Engineers once boasted, “We harnessed it, straightened it, regularized it, shackled it.” This vast system, built to keep southern Louisiana dry, is the very reason the region is disintegrating, coming apart like an old shoe. – But if control is the problem it must also, by the logic of the Anthropocene, be the solution. And so a huge new public-works project is getting under way—this one aimed not at flood control so much as at controlled flooding. Ten pharaonic structures are planned. The furthest along of these is slated for Plaquemines Parish. It will feature enough concrete and riprap to pave Greenwich Village and, when operating at full capacity, will, by flow, be the twelfth-largest river in the country. – With each failure, the levees (they started building them following 1719 submergence of New Orleans, a year after it was set up by the French Colonialists, by 1730 there were 50 miles long, built mostly by african slaves) were improved—built higher and wider and longer. By the War of 1812, they ran along the river for more than a hundred and fifty miles. – C.P.R.A.’s (Coastal Protection and Restoration Authority, next to Centre for River Studies in Lousiana) “bold” scheme for saving Plaquemines is to rehabilitate the crevasse for the post-crevasse era. The agency’s master plan calls for punching eight giant holes through the levees on the Mississippi and two more through those on its main distributary, the Atchafalaya. The openings will be gated and channelized, and the channels will themselves be leveed. C.P.R.A. likes to characterize the effort as a form of restoration, a way to reëstablish natural processes. And that’s true, but only in the sense that trucking salmon upstream, or using planes to train whooping cranes to migrate, is natural. – The first artificial crevasse scheduled to be built is a USD 1.4 B project known as the Mid-Barataria Sediment Diversion. The diversion will be six hundred feet wide and thirty feet deep. It will start on the west bank of the Mississippi, some thirty-five miles upriver of Buras, then, in evident defiance of hydrology, run in a perfectly straight line due west for two and a half miles, to Barataria Bay. When it’s operating at maximum capacity, 75000 cusecs water will flow through it. Nothing quite like it has ever been attempted before. – “In 1900, about ten per cent of the Red River and the Mississippi put together was going down the Atchafalaya,” Harvey explained. “In 1930, you had about twenty per cent. By 1950, you had thirty per cent. We still do the seventy-thirty division.” This was the trend line that prompted the Corps to step in. “From here down to the mouth of the Mississippi is about three hundred and fifteen miles,” Harvey at Army Corps’ Old River Control said. “And from here to the mouth of Atchafalaya is about a hundred and forty miles. So it’s about half the distance. So the river wants to go this way. But if that happens . . .” His voice trailed off. – In the ordinary course of events, the Atchafalaya would have kept widening and deepening until, eventually, it captured the lower Mississippi entirely. This would have left New Orleans low and dry and rendered the industries that had grown up along the river—the refineries, the grain elevators, the container ports, and the petrochemical plants—essentially worthless. Such an eventuality was thought to be unthinkable, and so, in the nineteen-fifties, the Corps stepped in. It dammed the former meander, known as Old River, and dug two huge, gated channels. The river’s choice would now be dictated for it, its flow maintained as if it were forever the Eisenhower era. Study Consequences of groundwater depletion to agriculture A new Council of Agricultural Science and Technology, or CAST, paper examines the causes and consequences of groundwater depletion throughout the U.S. with a focus on how this will affect agriculture—the largest sector of groundwater use. Manipur A village with carbon positive tags Phayeng is a scheduled caste village of the Chakpa community in Imphal West district (Manipur) and its conservation efforts are mainly linked to the belief that the forest is a sacred grove, but the idea has changed over the years. It is using its lush community-managed forest to develop itself as India’s first carbon-positive settlement. Haryana NGT Slaps Rs. 10 Cr Fine On Gurgaon Builders NGT bench noted that consent to establish and operate has not been obtained by the builders in Sushant Lok 2 and 3, as required under the Water (Prevention and Control of Pollution) Act, 1974. It also held that since neither environmental clearance nor consent to establish and operate has been taken under the Water Act, the builders will have to furnish performance guarantee of Rs. 5 crores to the satisfaction of the CPCB within a month, undertaking to comply with the statutory norms within three months. The tribunal further said it was surprised that in spite of the report submitted about five months ago showing violation of law, no action has been taken by the statutory authorities, particularly the Haryana State Pollution Control Board. Goa SC suspends EC for Mopa Airport The Environmental Clearance granted for the construction of a new airport at Mopa in Goa has been suspended by the Supreme Court. The EC will remain suspended until the Expert Appraisal Committee (EAC) revisits the recommendations made by it for the grant of an EC, including the conditions which it had formulated. Droughts are a major concern in India. These river plays an important role but still need an alternative to all these.